1. Litter box and litter. This is only if you plan on training a house rabbit. Get a box big enough for your rabbit to comfortably turn around in, and stay away from pine shavings. 2. Rabbit cage. 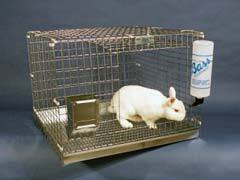 Rabbit cages come in a variety of sizes, suitable for indoor or out. If you plan on keeping many rabbits, you may want to consider building one. 3. Food and water bowls. Because rabbits like to chew on things, be sure to purchase heavy ceramic bowls. 4. Bedding. Bedding is one of the rabbit supplies that does not have to be store bought. Use old towels to make a soft spot designated specifically for your furry friend’s sleep time. 5. Nesting box. This will be your rabbit’s comfort zone and private area. 6. Loose hay. Hay is necessary for the rabbit digestive system, as it helps them pass hairballs. 7. Chew sticks. Rabbit teeth constantly grow and need things to chew on for their oral health. 8. Rabbit food. Be sure you’re feeding rabbits specialized rabbit food. 9. Toys. Look around the house for these. Almost anything is acceptable as long as your rabbit can’t chew and swallow it. 10. Grooming supplies. Be sure to have a flea comb, a wire brush, and nail trimmers on hand. Of course, if you really want to spoil your rabbit, you should look into rabbit hutches. These oversized, most often double-decker, homes are the Taj Mahal of rabbit residences. When you’re ready to bring your new pet rabbit home, be sure you have these rabbit supplies to ensure a smooth transition.